This post originally appeared on the Burlington Public Schools Educator Evaluation website. 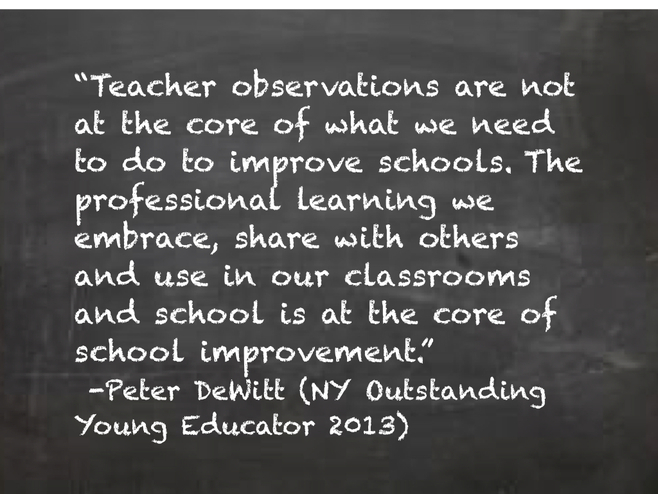 “Unannounced observations” – Let’s admit that the idea of such a thing for brings about at least a minimal amount of internal unrest for educators. Personally, i am reminded of the game hide and seek and the announcement that the seeker makes – “ready or not, here I come!” However, creating unrest and distrust on the part of teachers is not the way to improve teaching and learning in our classrooms. The way to accomplish this is to create more opportunities to share and discuss best practice. Our main goal from the outset of this new teacher evaluation system has been to create more conversations around teaching and learning. Please keep this in mind as we head into the unchartered waters of “unannounced observations” in Burlington. This is not intended to be a game of “gotcha” where evaluators walk into teachers classrooms when they least expect it. This is intended to be an opportunity for all of us to share examples of the Burlington Public Schools Great Eight in action. We look forward to sharing in those discussions! Stay tuned for the next post which will share a few of the logistics of Unannounced Observations.